Hybrid cars have been around longer than most people realize. A man by the name of Goldsworthy Gurney invented a steam car in 1825 which made an 85 mile road trip in ten hours. In 1897 the London Electric Cab Company produced a fleet of cars known as the Bersey Cabs. This fleet was powered by a 40-cell battery and three horsepower electric motor. Around the same time, the Pope Manufacturing Company of Harford, Connecticut manufactured approximately 500 electric cars over two years. Within the first few years of the twentieth century, thousands of electric and hybrid cars were manufactured, but when Henry Ford introduced the assembly line approach to manufacturing cars along with the technology to produce a self-starting engine, the hybrid concept quickly declined. By the mid 1960s people expressed interest in reducing pollution. In response, the U.S. Congress introduced the first bills recommending use of electric vehicles. Three scientists engineered a practical hybrid powertrain between 1968-1971, and many of the concepts found in this system are still used in hybrids today. At the time, GM was on the cutting edge, too, with its experimental hybrid model, the GM512. It operated entirely on electric and could get up to 10 mph. This car was powered by batteries and a two-cylinder gas engine. In the 1970s interest in hybrids grew even more when gas prices skyrocketed due to the Arab oil embargo. During this time, the U.S. Department of Energy conducted tests on several hybrid vehicles including the VW Taxi which allowed for switching between the gasoline engine and electric motor. 1974 - Gas-electric hybrid prototype created using a Buick Skarlark body. The U.S. Environmental Protection Agency certified this hybrid met strict guidelines for an EPA clean-air auto program but rejected it. 1975 - AM delivers 352 electric vans for the U.S. Postal Service to test. The Energy Research and Development Administration started a program to encourage the development of hybrid technology. 1976 - Congress enacted the Electric and Hybrid Vehicle Research, Development, and Demonstration Act of 1976. General Electric was selected to build a parallel-hybrid sedan. Toyota also built a small hybrid sports car with a gas-turbine generator supplying current to an electric motor. These years were foundational in inventing and improving hybrid technology. By 1992 Toyota announced the Earth Charter which outlined goals for the development and marketing of vehicles with the lowest possible emissions. Just five years later, Toyota introduced the Toyota Prius to the Japanese market. One deterrent for buying a hybrid car is that retail prices are more expensive. While hybrids can save a lot of money on gas, making the initial investment is a bit more than some people are willing to make on the front end of the deal. A better way to look at it is as an investment in the future of our planet and to realize that you'll recoup the difference over time and in the long run save money. An advantage to hybrid cars is that they run quieter and cleaner than conventional cars. 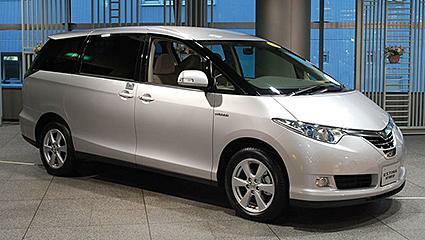 This along with their exceptional gas mileage makes owning a hybrid an attractive option. Another benefit to take into consideration is that the government extends more tax breaks and other incentives to owners of hybrid cars. On the negative side for hybrid ownership is the fact that when a hybrid car is in an accident it is more difficult for rescuers to get you out of the car due to the electric motor and the increased risk of electrocution. The cost of replacement batteries for hybrid cars has been a concern in the past with replacements costing thousands of dollars. The thing to take into consideration is that these hybrid battery packs are made to last for the life of the car and the warranty covers batteries for somewhere between eight and ten years. The real concern with the batteries for many environmentally conscious folk is toxicity upon disposal. This doesn't need to be a concern because most hybrids manufactured today use NiMH batteries which can be recycled without a problem.